From Heathkit to home theater: a longtime reader brings us up to date. Back in 1970, when Gary Smith wasn’t selling electronic equipment or playing rock-and-roll on his 1966 Fender Stratocaster, the 21-year-old musician/hi-fi buff was busy building speakers, making open-reel recordings, and fooling with his Heathkit oscilloscope (which, interestingly, he used as a record-level meter following the suggestions of STEREO REVIEW contributor Craig Stark). The highlight of Smith’s Tulsa apartment in those days was a very cool audio system: two Teac open-reel tape decks, a Marantz turntable, a Realistic AM/FM tuner, an AR amplifier, and a home made control box/mike mixer he used to switch between a remote pair of Altec Lansing 848A’s and a couple of gargantuan three-way speakers of his own design. The electronics were housed in the hutch of a buffet cabinet Smith had converted into an audio console. The setup was so hip that it made “Installation of the Month” in our August 1970 issue. Twenty-five years and many impressive musical credits later, the audio enthusiast in Gary Smith is still going strong. Of course, the system he and his wife Leanne enjoy today in their Branson, Missouri, home is a trifle more sophisticated than the classic console setup. For one thing, it’s a five channel Dolby Pro Logic-equipped rig that’s capable of transforming the Smiths’ living room into a mini movie theater. At the heart of the system is Sony’s landmark TA-E1000ESD all-digital A/V preamplifier/processor, the first of its kind when it hit the scene a few years ago. In addition to decoding Pro Logic sound tracks, it serves up nine surround modes, each of which can be customized, and provides a parametric equalizer and a subwoofer crossover. “I was looking for something that would handle all of my audio and video signals,” Smith recalls. “I use Pro Logic for movies, but I don’t really use all of the Sony’s other artificial reverb programs for music. I’m a purist. I prefer to listen to music the way it was recorded.” And the re cording studio is a second home to the 46-year-old Smith, an accomplished guitarist and recording engineer who toured with the Seventies country-rock band the Ozark Mountain Daredevils (of Jackie Blue fame) and has per formed live or in the studio with Roy Clark, Dominick Allen (of Foreigner), Brewer and Shipley, Ray Stevens, and Pat Boone. 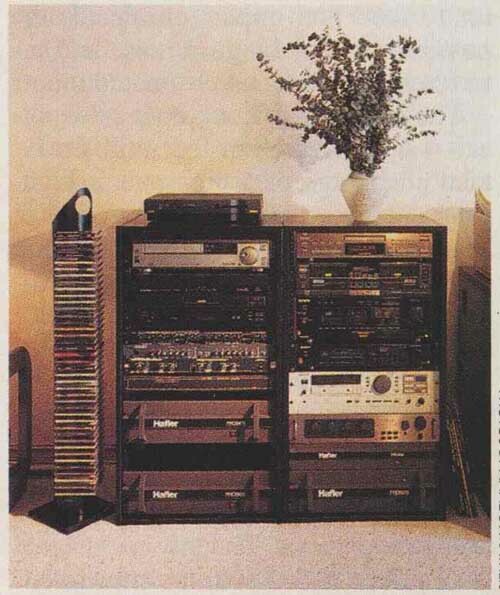 Smith uses the DA-8X2 to send balanced audio signals to systems in the bedroom and music room and to a JBL M552 electronic crossover in his main-system rack. The crossover splits the signal between a pair of Hafler Pro 2400 120-watt-per-channel amplifiers. The bi-amped signal is delivered to a pair of Tannoy System 10 professional studio monitors via 10-gauge Monster Cable. “I’m so used to using Tannoy monitors in the recording studio that I can rely on their sound for reference,” Smith says. Each speaker employs Tannoy’s trademark dual-concentric driver, in this case a 10-inch woofer with an integral tweeter. A pair of low-frequency Tube Traps from Acoustic Sciences Corp. (ASC) serve as speaker stands, and Smith uses aluminum Tiptoes to isolate the speakers from their stands. The subwoofer output of the Sony A/V preamp directs frequencies below 150 Hz to a DOD Model 866 professional sound limiter/compressor, which in turn feeds a Tannoy PS-88 powered subwoofer. “I stuck another limiting device in the signal chain to tighten up the bottom,” explains the recording engineer in Smith. The compact sub- woofer, which sits just behind the right main speaker and to the right of the fireplace, packs two 8-inch drivers, an active crossover, and a 100-watt amplifier, and Smith says it thunders down to about 30 Hz. Music comes first in this household, so when it’s time to watch a movie, Smith pulls out an extra Tannoy PBM 6.5 and sets it on top of his 31-inch JVC TV. The part-time center speaker is powered by a spare Hafler Pro 1200 65-watt-per-channel amplifier that’s bridged to 150 watts mono for this application. 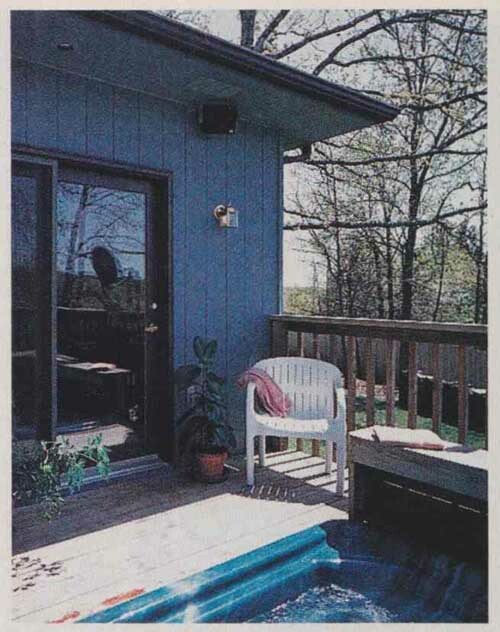 A second Pro 1200 amplifier (the one shown in the main-system rack) is used to power a pair of Advent in-wall speakers in the adjoining family room/ kitchen area and a pair of weatherproof Electro-Voice S-40 studio monitors outside on the eaves above the deck and hot tub (photo at right). Switching is done via a home made box. 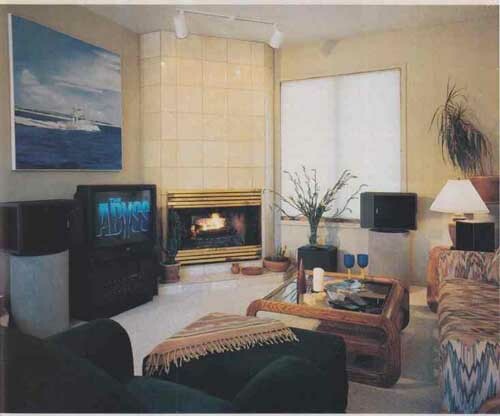 Down the hail from the living room is the music room — a cozy recording studio built around an Alesis ADAT eight-track digital recorder that uses S-VHS videotape as the recording medium (photo on page 78). The studio is where Smith spends much of his time. That’s where he did all of the sound track recording and video editing for two fishing videos he produced earlier this year, for example. 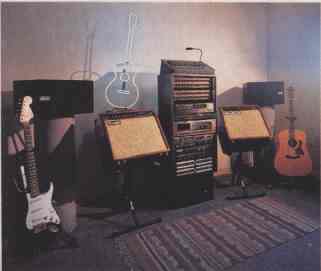 To play back works in progress, Smith uses a Yamaha CDX-900U CD player, his favorite Hafler 250-watt- per-channel DH 500 power amplifier, and a pair of Acoustech Model 8025 two-way studio monitors. Each of the speakers sits on top of a midrange Tube Trap from ASC. The amp is tucked away in a nearby closet to squelch the noise from its internal fans. The component rack is loaded with professional studio gear, including a DOD Model 1222 twelve-channel mixer, two Pro- Co forty-eight-point patch bays that facilitate myriad signal-routing possibilities, two Model 4001 one-third-octave equalizers from White Instruments, a Lexicon LXP 1 effects unit for vocals and instruments, and a Fishman acoustic-guitar blender Smith uses during live performances. Rounding out the collection of toys in his playroom are a couple of Smith’s prized guitars the Strat and a Taylor acoustic and two Mesa Boogie guitar amplifiers. Even at the end of a long day, Smith likes to keep the music flowing. 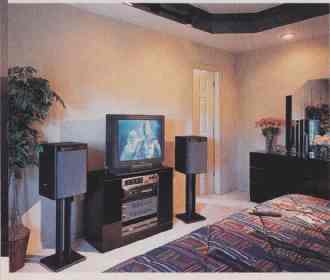 In his bedroom you find a nice little system (see photo above) consisting of another Carver C-1 preamp, a Pioneer DM502 six-disc CD changer, two DOD Model 831 one-third-octave equalizers, yet another Hafler Pro 1200 power amp (for a total of three), and a pair of E-V Sentry 100A you guessed it — studio monitors. “Many records were mixed using Sentry 100A’s,” Smith says of the two-way speakers. “In the Seventies and early Eighties, they were a staple in recording studios.” Each of the Carver’s outputs passes through a DOD EQ on its way to the Pro 1200. If Smith wants to listen in on whatever source is playing in the living room or the music room, all he has to do is switch inputs on the C-1. A Sony KV-27TS27 27-inch TV completes the nocturnal lineup.